The first IF game written in Swedish. First public release of the mainframe version was in 1978. A commercial version for MS-DOS was released in 1986, with the slightly altered title "Stugan". Stuga (Viggo Eriksson, Kimmo Eriksson and Olle E Johansson; 1978; DEC Basic; Swedish). Stugan (publisher: Scandinavian PC Systems aka SPCS; 1986; Better Basic for MS-DOS; Swedish). 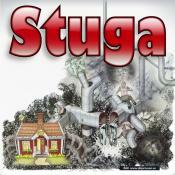 Stuga (porters: Johan Berntsson and Fredrik Ramsberg; 2007; Z-code; Swedish). Cottage (translator: Johan Ottosson; 2009; Z-code 5; English).